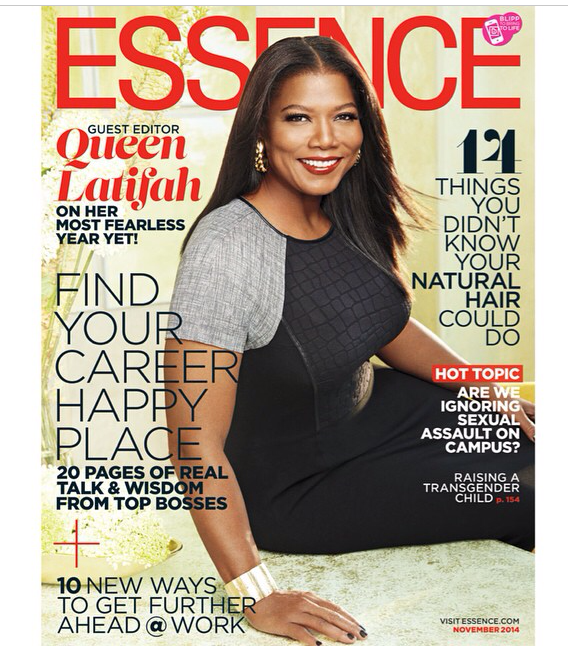 For Essence Magazine‘s November Career Issue, the mag invited Queen Latifah to appear on the cover and act as the Guest Editor. Currently keeping Latifah busy is a partnership with BET to produce original programming at the Centric channel through her ever-evolving entertainment company, Flavor Unit. The channel will reprise the hit series Living Single as well as The Queen Latifah Show for starters, but Latifah is most excited about creating and developing new programming for Black women. And, of course, there’s her main gig as a daytime TV talk show host. Now in its second season, Queen Latifah says she will now take the show in new and exciting directions—so stay tuned! She is happy with its successful ratings and how the community has embraced it, but she wants more from it: “I want it to be a hit on my terms.” Spoken like a true boss! For more on how Queen Latifah avoids “oversharing” her personal life, how she defines power—”Power is something that comes from love”— and more, pick up the November issue of ESSENCE, on newsstands now.